Dumb brother came over, with my newborn little nephew. Here's a few snaps of the little tike, tyke, however it's spelled. Dumb brother came over, with my little nephew. Here's a few snaps of the little tike, tyke, however it's spelled. Tell me about it, G-man! We did a pretty interesting lift job yesterday in the middle of downtown Las Vegas at the Wynn Casino! That's the real Nobu and I on the second picture. The last picture shows how long the line actually was (so we don't blow over any of the newly planted trees). I'll see if I can get more shots posted. Nitay: Sounds like a cool musical event. The two puppets slightly remind me of the two old grumpy men from the Muppet Show. I am sorry, I erased your pics from this thread. They were so big, we had issues with people trying to load this thread. You're in the cockpit of the Concorde! How do you know, Gilly? Gilly will have spotted the oddball Control yoke and the visor frames outside the windscreen. I don't see anything in that cockpit that looks like hauling @$$. . . .
Hey Leia! Where were you at? Were was the plane? an N reg'd 182 Millenium!!! I looked at Leia's profile, and then clicked on her homepage, which is her flight journal. 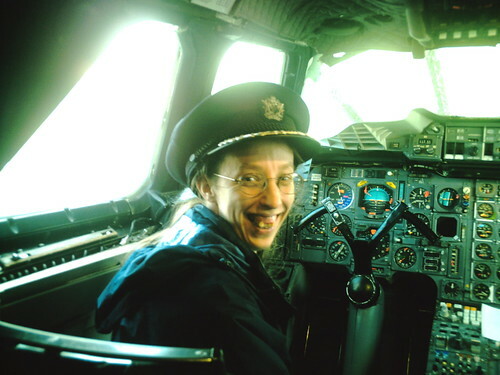 And it has that picture and says that she imagines herself behind the wheel of the Concorde.